Theories abounded that the Obamacare dissent was originally written as the majority opinion, before one of the votes in favor of striking the law changed his mind. In a related story, researchers located the last person in the country still swayed by President Obama’s speeches. 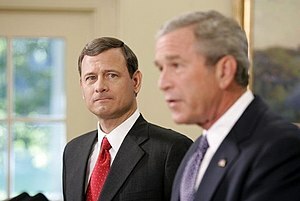 His name is Chief Justice John Roberts. Gay marriage advocates received a morale boost about their chances in a potential Supreme Court case when Chief Justice John Roberts switched teams. Arizona Governor Jan Brewer, who on Monday lost her bid to have the Supreme Court uphold her state’s immigration laws, immediately moved to pass a new law that would drive up healthcare costs, deter future doctors from entering the field, and generate the biggest tax hike in state history, but then remembered that the court ruled she couldn’t pre-empt federal law. The EPA’s appeals court victory earlier in the week guaranteed their ability to regulate CO2, and thus regulate the air that people exhale, but they couldn’t figure out how to regulate people breathing in. Fearing the entire country would simply hold their breaths until their heads exploded, the EPA was relieved to hear Obamacare taxes people for breathing in as well, thus mitigating this statist crisis. The House voted Attorney General Eric Holder in Contempt of Congress by a 255-67 margin. If you’re wondering why the total vote was much less than usual, it’s because dozens of Democrats walked out in protest, and over to the Supreme Court to ask Chief Justice John Roberts if he’d be willing to rewrite the Contempt resolution for them in a more favorable way. On Wall Street, the stock market shot way down and then back up. Many market observers pretended there was something rationale about the activity. This entry was posted in Fridays with Frack and tagged Bill Clinton, Jan Brewer, John Roberts, New Yorker, Obama, Patient Protection and Affordable Care Act, Supreme Court by frack. Bookmark the permalink.